Our UPS delivery man sure knows the way to Quilter's Garden! We have just received a shipment of Moda precuts. Beth is out on the floor planning quilts as I type away! We think these colors are going to be exceptional! Did you know we also have cork fabric? Isn't it cool? We have it available in a really neat navy too. We will be accessorizing our purses with this fabric and will be selling it in smaller cuts. Stop in to see it today! E sther is another one of my favorites. I think I really admire her as she always kept a cool head. Not always one of my best traits! LOL I'm going to make this short, but I have to tell the story about MY Esther. For many years, I was fortunate to attend a Bible study and learn from my friend, Esther Windmiller. One summer my sister was home from Texas and I kept saying to her, "Esther says............, Esther says..........., Esther says........ You get the picture. I was telling her all of the good advice I had learned from Esther. After a few hours, my sister said, 'Boy, I'm going to have to go back to the Bible and read the book of Esther. I don't remember it saying all of that." Of course I started laughing and said, "No, not the book of Esther, I was talking about Esther my Bible study teacher." I hope this block will remind you of someone who played an important part in your life! To get your free pattern, CLICK HERE! 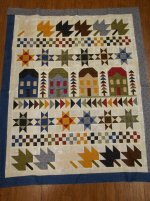 If you are doing our Harmony Row Quilt in Garden Club, you will be 2 fabrics short. When cutting the kits, the fabric list was so long that we didn't see the fabrics needed on the top of page 2. We will have Fabric J and Fabric L at the store for you. F.Y.I. You might be able to get the amount needed out of your reserve fabric. It will be close, but it can be done!